My normal superpower is knitting…. 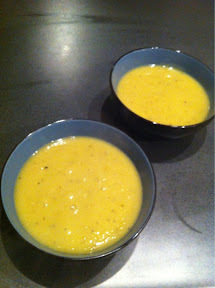 But today I made the greatest soup of all time, creamy, delicious, amazing, and all gone. So this will be made again. Tomorrow. Peel the Kumara or sweet potatoes roughly. I like leaving some of the flesh. Cop into rings about half a cm wide. Waiting for soup isn’t my strong suit. 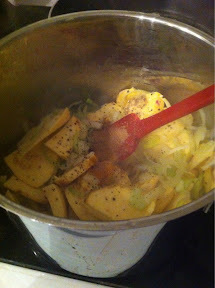 Dice the onion and chop the leek. Toss it all in a pot with the butter. Stir on a low heat until the onion is all soft and delicious looking. Add in the spices. I go for a lot of pepper because its amazing. But, salt and pepper to taste. Toss in the water and stock. 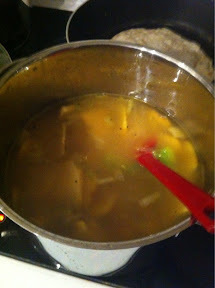 Chicken stock would be great if you are a meat eater. But I am not, so I stick firmly to vegetable stock. Boil. Keep the heat low and keep stirring. When the Kumara is soft, blitz with a hand blender. Prepare to serve and be amazed. The leeks make it all creamy and amazing. I was all ready to add cream, and then stopped myself because the soup was perfection. 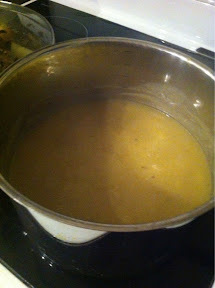 It makes about 4 servings, approx 2 litres of soup. If you are worried about the amount, throw in more water and another Kumara. I was typing a comment and it flew away. Maybe it will turn up. Thanks for sharing this. 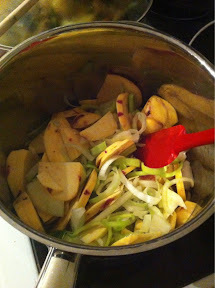 It will be featured on My Meatless Mondays and I am hoping, also on my table.